Terrigenous sediments are derived from land and are particularly prominent near the mouths of large rivers. These sediments are generally classified as silt, sand and mud. Pelagic sediments are derived from either organic or inorganic sources. Organic pelagic sediments comprise the remains of dead organisms and are further classified as either calcareous or siliceous oozes. Inorganic pelagic sediments are derived from materials suspended in the atmosphere and are generally classified as clay. It is convenient to categorize dynamic features of the ocean according to characteristic time and space scales. While no precise terminology is universally accepted, it is common to recognize space scales as large (>100 km), meso (100m-100km) and fine (<100m). Time scales are less precise, but generally distinguish among seasonal, monthly, inertial, tidal and other feature-specific time scales appropriate to currents, eddies, waves (both surface and internal) and turbulence, among others. The large-scale circulation of the ocean can be classified either as wind-driven or thermohaline. The former is due to wind stress acting on the sea surface, while the latter is due, in part, to density changes arising from variations in temperature and salinity (e.g. Pickard, 1963). 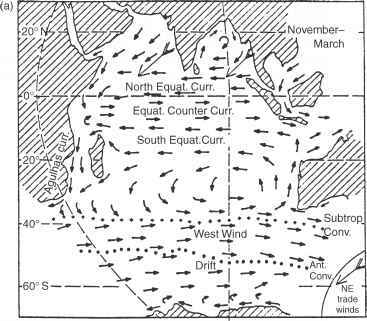 The wind-driven component of circulation is usually horizontal in nature and is restricted primarily to the upper few hundred meters of the ocean. In the case of upwelling or downwelling near coasts, the original horizontal flow is forced to become vertical due to the basin geometry. In the open ocean, bands of upwelling and downwelling can be created by divergence and convergence, respectively, of wind-generated surface currents. 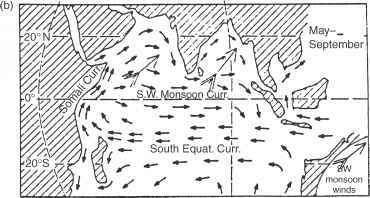 Such currents are commonly referred to as Ekman drift currents. The thermohaline component normally originates as a vertical flow arising from imbalances in the heat or freshwater (salt) fluxes near the sea surface. These vertical flows eventually become horizontal at a depth that is consistent with the density of the newly formed water. 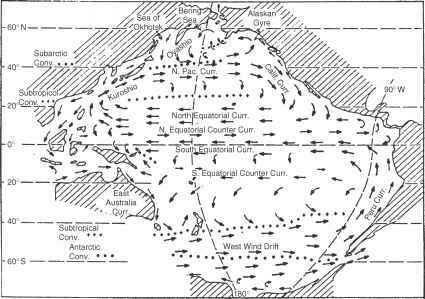 The circulation of the surface waters corresponds closely to the prevailing wind patterns. The water currents set in motion by the winds would encircle the globe in the absence of land masses. The land masses, however, obstruct the flow and force the water along the coasts, thus forming completed loops (or gyres) in the Pacific (Figure 2.16) and Atlantic oceans (Figure 2.17). The effect of changing wind patterns due to monsoons is evident in the Indian Ocean (Figure 2.18). 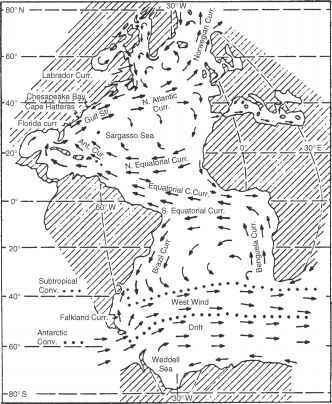 Only in the Antarctic Ocean does the absence of land masses permit true circumpolar flow at a latitude of about 60° S (Figures 2.16-2.18). Mesoscale oceanic features of importance to underwater acoustics include fronts, eddies (or rings) and internal waves. 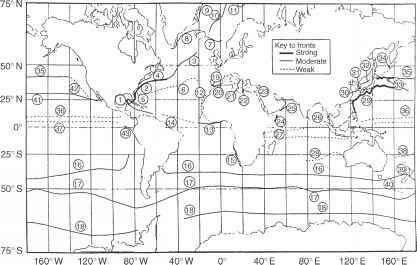 Ocean frontal features are frequently associated with major ocean currents or with vertical circulation patterns in areas of upwelling or downwelling. An example of ocean fronts associated with major ocean currents is shown in Figure 2.19 (Naval Oceanographic Office, 1967). This figure represents a range-depth section crossing the North Atlantic Ocean between Newfoundland (left) and Senegal (right). The hydrographic station numbers used in creating this section are shown at the top. Between stations 6 and 23, the isotherms are relatively horizontal. Two adjacent frontal features are evidenced by the vertically oriented isotherms between stations 3 and 6. These features correspond to the cold, southward-flowing Labrador Current (centered at station 4) and the warm, northward-flowing Gulf Stream (centered at station 5). The effects of the Gulf Stream frontal system are evident at depths exceeding 1,000 m.
Different water masses are commonly separated by a transition zone referred to as an ocean front. The degree of abruptness in the change of watermass characteristics (particularly temperature and salinity, and thus sound speed) determines whether the front is classified as a strong or a weak front. Ocean fronts are similar in concept to the more familiar fronts encountered in meteorology that separate different air masses. Cheney and Winfrey (1976) summarized the classification and distribution of ocean fronts. For underwater acoustic applications, they recommended the following definition of an ocean front: a front is any discontinuity in the ocean that significantly alters the pattern of sound propagation and transmission loss. Thus, a rapid change in the depth of the sound channel, a difference in SLD or a temperature inversion would denote the presence of a front. 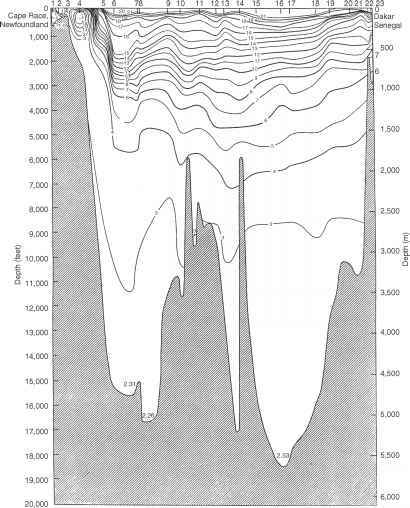 Figure 2.19 Vertical section of water temperature (°C) for the transect between Cape Race, Newfoundland (left), and Dakar, Senegal (right) (Naval Oceanographic Office, 1967). 1 Surface sound speed can change by as much as 30 ms-1. Although this is due to the combined effect of changing temperature and salinity, temperature is usually the dominant factor. 2 Differences in SLD on the order of 300 m can exist on opposite sides of a front during certain seasons. 3 A change in in-layer and below-layer gradient usually accompanies a change in surface sound speed and SLD. 4 Depth of the sound channel axis can change by 750 m when crossing from one water mass to the next. 5 Increased biological activity generally found along a front will increase ambient noise and reverberation levels. 6 Enhanced air-sea interaction along a frontal zone can cause a dramatic change in sea state and thus increase ambient noise levels and surface roughness. 7 Refraction of sound rays as they pass through a front at an oblique angle can cause bearing errors in sonar systems. Figure 2.20 Global distribution of ocean fronts. Numbers correspond to the generally accepted names, as listed in Table 2.3. Only the mean positions are presented. Due to seasonal variability, frontal locations can shift by as much as 200 km (Cheney and Winfrey, 1976).